This sweet little board book was my younger daughter’s first book. It was a gift from my own mom, and I loved reading it to my daughter. 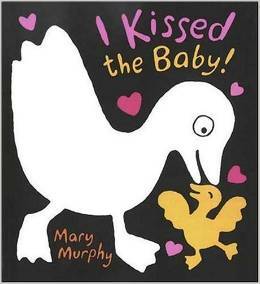 I loved how you almost have to kiss your baby when you get to the end of the book. It is always hard to gauge what a tiny baby thinks of a book, but I remember my daughter responding well to it. It has high contrast, primarily black and white illustrations, which is what is recommended for very young babies (because their eyes haven’t started differentiating color yet) and a simple, short story. It was a great way to start the bedtime story tradition that continues to this day!